The Grave Mapping add-on works with Secure CRM to allow cemeteries to plot and display the location of graves within an intuitive interface. With our Walk-to-Site mobile navigation, visitors and new staff members can quickly find graves without assistance or explore cemeteries at ground-level right from their computers. 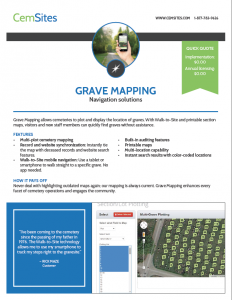 Grave Mapping offers multi-plot cemetery mapping, record and website synchronization. Use our built-in auditing features and instant search results with color-coded location status to sell graves in seconds. It is easy to integrate with an existing website platform and works well for cemeteries with multiple locations. By using Walk-to-Site mobile navigation, finding graves is now not only visual, but also interactive! Just use a tablet or smartphone to walk straight to a specific grave — no app needed. Search data and sync records with grave locations. View and sell available plots right from the map! Navigate to a specific gravesite with any GPS-enabled device. Give virtual tours and allow the community to explore the grounds without going outdoors. If you would like a printable PDF of information on our Grave Mapping, enter your email and we’ll send it over.